My books may look like they are, well, all over the map, but the first three are by the same publisher, for whom I worked in house when it was Prentice Hall Travel, a division of Simon & Schuster. The travel section changed names and affiliations and acquired and dropped imprints about as many times as Emelda Marcos changed her shoes. At one point, the Dummies acquired the Idiots–at least their travel titles. 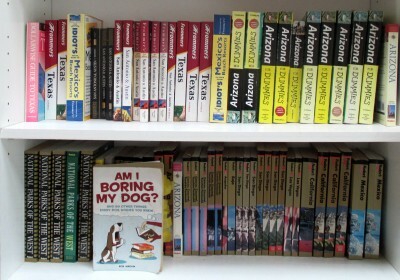 My fourth book, a kind of guidebook to dogs, was published by an affiliated publisher, Alpha/Penguin: Alpha Books publishes the Complete Idiot Guides. Confused yet? My new book, a memoir of my days in travel publishing and writing, tells the story of that conglomeration of the industry, and much, much more. It’s the one with the catchy title that you can’t miss on this blog. Am I Boring My Dog: And 99 Other Things Every Dog Wishes You Knew .